Another breed bearing a rather misleading name, the Bandog is becoming increasingly popular worldwide. The name Bandogge was used in the past as a synonym for the English Mastiff in Britain, as well as to describe any large dog that was tied down, probably coming from a Saxon word "banda", meaning "chain". So, by definition, the Tibetan Do-Kyi could be considered a bandog, as its name means the same thing. The bandogs of old were strictly working crossdogs of various sizes and usually coarse-haired hunters, fighters and property protectors without a strictly set type, developed from eastern shepherds and mastiffs crossed with western bullenbeissers and hounds, with a few local bloodlines eventually being established as specific types in some regions, such as Britain, Spain, Germany, Italy, Poland and elsewhere in Europe. Apart from the English Mastiff, Alano Espanol, Presa Canario, Rottweiler, Neapolitan Mastiff, Cane Corso and many other working dogs of common bandog type which eventually evolved into bona fide breeds, we mustn't forget that one of the most famous bandogge programmes in England directly led to the establishment of an immensely popular and fully recognized British breed, today known as the Bullmastiff. A great number of local bandogge strains have survived worldwide and these working crosses still exist under a variety of names, but the modern type commonly accepted as the American-style Bandogge today was developed, or rather "dreamed up" in the 1960's by an American veterinarian John Swinford, who set out to create a property guardian dog superiour to all others by crossing English Bullerriers and American Pit Bull Terriers with English Mastiffs and Neapolitan Mastiffs. While Swinford himself failed in his attempt to establish a worthwhile product, his legacy, for better or worse, has inspired legions of experimenters who have produced their own bandogge varieties, with some even going as far as referring to their dogs as "Swinfords" even though neither their dogs nor programmes have anything to do with the original John Swinford fiasco. The widely accepted recipe for an American Bandog is usually 50% American Pit Bull Terrier and 50% Neapolitan Mastiff, although some breeders use other mastiffs as well, like the English Mastiffs, Bullmastiffs, Cane Corsos, Rottweilers, Japanese Tosas, American Bulldogs, Brazilian Filas and so on, as well as English Bullterriers, American Staffordhires, Irish Staffies and others for the bull-n-terrier part of the equation. 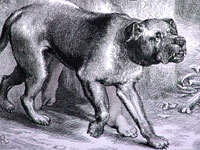 Interestingly enough, there are not many known bandog programmes involving the use of Molossers such as the Central Asian Shepherd, Irish Wolfhound, Spanish Mastiff or any of the old terrier and hound breeds, all of which would be historically more correct than the modern "American cocktail", which relies on breeds which didn't even exist at the time bandogges "ruled" Europe. There is a number of modern Bandog breeds worldwide, such as the Czech Bandog, Australian Bandog, German Bandogge, Brazilian Bullmastiff, Ambullneo Mastiff and others, but most fanciers still associate the Bandogge name with the Swinford-concocted recipe, where the father should be a game-bred bull-n-terrier breed and the mother should be a large mastiff-type dog. However, many enthusiasts believe that a non-working "bandog" isn't really a Bandogge, since crossing two breeds together for any purpose other than protection work will produce nothing more than an ordinary mutt. The Bandogge, be it the American or any other variety is strictly a working breed and should be a result of serious and dedicated planning, starting from careful selection of parent breeds and more importantly, appropriate representatives of those breeds, with the health and temperament testing being on the top of the list of priorities, while the uniformity in appearance is the last of the breeders' concerns. A well-bred Bandogge is a confident watchdog, more than capable of protecting its master and property. Muscular and massive, it can easily overpower an intruder, real or perceived. Depending on the traits inherited from its parent breeds, this can be a smart dog, very intuitive and trainable, but it may also be strong-willed, overly dominant and difficult to handle, especially if owned by inexperienced masters. A loving family dog, the Bandogge is very gentle with children and devoted to its owner, making a good urban companion and guardian. However, even though animal-aggression is an undesired trait, the Bandogge can be quite unfriendly towards other dogs, needing early and broad socialization and responsible handling and training. Since most bandog programmes are based on performance qualities and not looks, there is a variety of appearances and sizes, with some dogs looking like giant Pit Bulls and others resembling smaller Bullmastiffs, but as a rule all Bandogges must be agile, strong and powerful. The ears can be cropped and the tail is sometimes docked, although unaltered examples are common. The coat is short and smooth, commonly seen in shades of blue, grey, red, fawn, black and brindle, with or without white markings. The average height is around 27 inches, but much smaller, as well as taller dogs exist.